Seven hectares of gardens offering a relaxing escape from the city. The grandest Ballroom of the city offering Magnifique events for up to 1000 people. Indulgent SoSPA offering an array of wellness treatments. Extensive Sports Club with Tennis Courts, Pool, Squash Courts and Fitness Center. Four gourmet restaurants for the ultimate culinary journey. 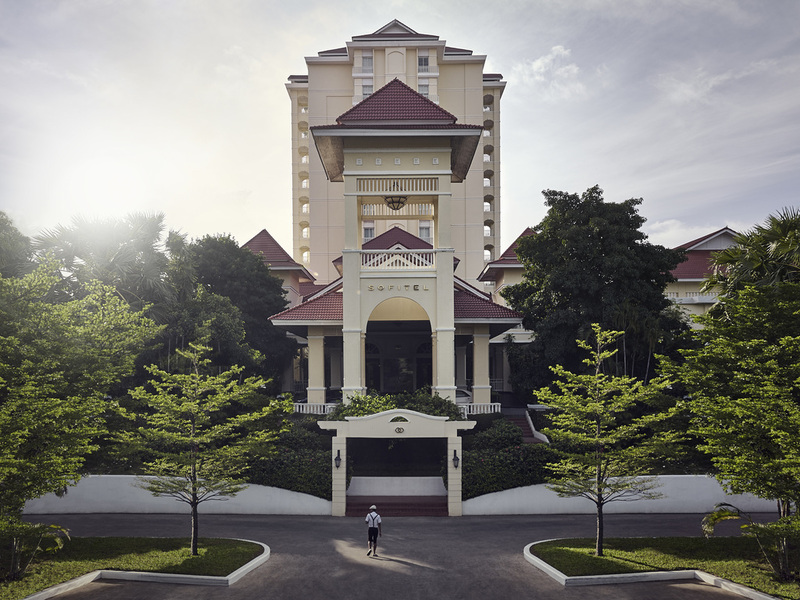 Sofitel Phnom Penh boasts stunning colonial style rooms with a modern Khmer touch and polished hardwood floors-heavenly Sofitel Mybed bedding, high tech plug & play electronic facilities, TV & sound equipment make for a delightfully comfortable stay. An all-day dining concept, with live cooking stations and a marvelous array of Western and Asian specialties. Champagne, brunches, fresh seafood and an impressive selection of wines. Our Italian restaurant offers an intimate setting with an open kitchen and wooden floors. The Menu offers contemporary and innovative cuisine with an Italian touch paired with fine wines from the cellar. A wonderfully Zen Japanese restaurant with 6 private tatami rooms. Experience the traditions of old Japan and savor the sophisticated flavors of authentic Japanese cuisine, while our Chefs mastering the art of fresh sushi and sashimi at the sushi bar. Enjoy our tea or mocha in our refined Salon de Thé offering French pastries such as croissants, the best in the country, wonderful pies and cakes, as well as a vast range of handmade chocolates and truffles. A modern and traditional Chinese restaurant. In one of the 5 private rooms enjoy authentic Cantonese cuisine with a contemporary twist. On Saturdays revel in the Dim Sum Brunch with all You-Can-Eat Dim Sum, Asian Delights and Peking Duck station. The ultimate in exclusivity and limitless luxury, Club Millésime is an exclusive VIP lounge dedicated to providing service excellence and superior attention to detail in a sophisticated and modern environment. Guests can enjoy a complete bar service around the pool and day bed areas. Enjoy an extensive list of exotic cocktails, fresh juices, ice cream and light meals - an extensive bar menu with healthy options is available. An elegant setting for afternoon tea, or return as the sun sets for signature cocktails and light tapas with a soothing piano playing in the background.